Emma Steendam of She Sows Seeds on family farming, rural life & the perfect Christmas spuds! 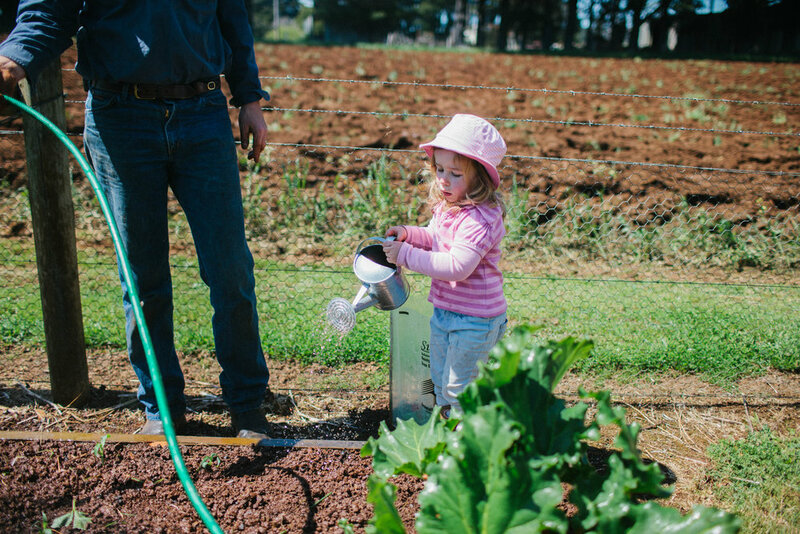 Emma Steendam is a farmer based in the potato-growing region of Thorpdale, Gippsland, and an award-winning blogger and photographer at www.shesowsseeds.com In this guest blog post Emma reflects on her thoughts and experiences with family farming and country living. She also shares a recipe for the perfect Christmas spuds! Photographs by Emma, with some family photographs by Colour of Life Photography and Lisa Hayman Photography. Growing up on a potato and sheep property in the rolling Thorpdale hills of green Gippsland, I don’t think it occurred to me that I would ever live anywhere other than on a farm. My siblings and I spent our childhood running under irrigators, stomping on a wool press and waking to the thunk-thunk-thunk of spuds hitting the picker’s buckets at dawn. I just assumed that my own children would experience the same. Then, as fate would have it…I married a farmer. Ten years after finishing university in ‘the big smoke’ (photography for me and ag science for him), we’ve had a variety of experiences and roles in agriculture – from producing embryo transfer Angus and Charolais calves in north east Victoria, to the heartstrings pulling us home to Thorpdale for a year of growing potatoes and prime lambs, myself working in my family’s produce trading, transport and farming business, throwing in some cropping experience in the southern Mallee and my husband milking cows growing up, to heading north to cut our teeth on some larger scale beef operations in outback Queensland, then bumping our way along outback tracks around Australia before landing on a 10,000 acre beef and sheep property in South Australia…it seems we really are jacks of all trades and masters of none! I followed my high school sweetheart to ‘go bush’ after uni, to a 1200 acre beef property, somehow falling into a job treading the boards of the Yea cattle sales with Elders, weighing and tagging calves in the Murrindindi fog and sleet with absolutely zero experience with cattle! That same farmer boy proposed atop that cattle property…then promptly took off in a cloud of dust in the ute to deal with a prolapsed heifer, leaving me with the kelpies, a diamond ring and a bottle of champagne. Welcome to life married to a farmer (I ended up helping him pull that calf in the dark by the lights of the motorbike, and we saved the heifer). We spent our honeymoon working on an outback station in central-west Queensland, mustering wayward mickey bulls, wrangling equally bull-headed twins in the schoolroom through Longreach School of Distance Education and chasing snakes out of our donga. A romantic baptism of fire into life as a woman in agriculture. Eventually we bumped our way around Australia (and to Papua New Guinea with some more beef experience and learning how to run a large-scale farm in a tropical third world country thrown in there), with no planned destination or end date, literally driving down dirt tracks wondering if this would be ‘home’. We followed our noses to Cape York and along the Savannah Way, into the Northern Territory and through the Kimberley, down the West coast, across the Nullabor and eventually found ourselves on the Limestone Coast of South Australia, pulling up stumps and working for a year as beef overseer near Padthaway. But we have serendipitously found ourselves back where I started: on my family’s farm in Thorpdale, raising our young family in a farming community…just as I imagined. Full circle. My husband, Matt, is from farming stock (his grandparents farmed in Kardella, South Gippsland), but his parents were not farmers. Our path through the agricultural landscape has not been the traditional ‘son returning to the family farm’ scenario. It has been varied and not without big questions and searching for the right fit, but I think it’s important to highlight that this path we have taken (at times unwittingly!) has opened doors for us through chances grabbed and leaps of faith taken. The sometimes unconventional path which has twisted and turned to land us back ‘home’ is a story which I wish someone had told me ten years ago could happen. A career path in agriculture, especially for women, needs to have flexibility and scope to grow and change with you across a lot of different scenarios. Adaptability has become my middle name as I have found my feet with unfamiliar beef cattle, summer fodder crops, living remotely and out of our ute for 18 months, to the more familiar work of dealing with Dad’s dispatch book and truck paperwork on a busy April Friday afternoon at the peak of spud season. All of it has been important work to shape the role I now see as my most important ever: mother to two possible future farmers. Growing good spuds and hard working girls in this rich soil of my childhood, I am excited to see where the agricultural landscape could take my girls – because I know every woman in ag’s story is completely different and unique. Mine is testament. My husband currently works off farm in agribusiness finance – a role which we had long contemplated being a possibility, so when the opportunity arose we took it. Working off farm is one thing, but living off farm and raising our children not in a direct farming environment was not on our agenda. And so, we live on my family’s sheep and potato farm in Thorpdale, our girls Eleanor and Harriet are the fourth generation to be growing up here. As well as raising our children as part of a family farming operation, being involved in a small rural community is also important to us, both having had the same upbringing ourselves we wanted the same for our girls. When I moved from Melbourne to Yea to be with Matt, I re-discovered my love for small country towns, for the community that envelops you, for sharing half a dozen eggs as a currency down the street and knowing the UHF channel of the bloke halfway to town who’s left the gate open to his steers. Over ten years being involved in lots of different farming communities, the one constant is generosity of spirit and genuine humility. Country people are kind, generous and hard working. If that’s all of the attributes my children obtain from their country farming childhoods then my work is done. We are not complicated people: I spend my days stomping about in the veggie patch and talking to my chickens with my toddlers in toe. My love of simple country living knows no bounds, from making jam with plums on the trees overhanging our road that I forage with my girls, to growing my rambling roses and pumpkins up the back of the veggie patch, very simple things are very important things to me. My days are busy…but in a good, simple kind of way, doing the important work. Some days we feed shearers or go into town to the lamb sale, some days I pick up a spare part for a tractor, or try to pay wages and build lego with the other hand. We are no different to any other farming family across Australia, busy (so busy) with young children at my feet but jobs to be done regardless. And increasingly, a story to be shared. 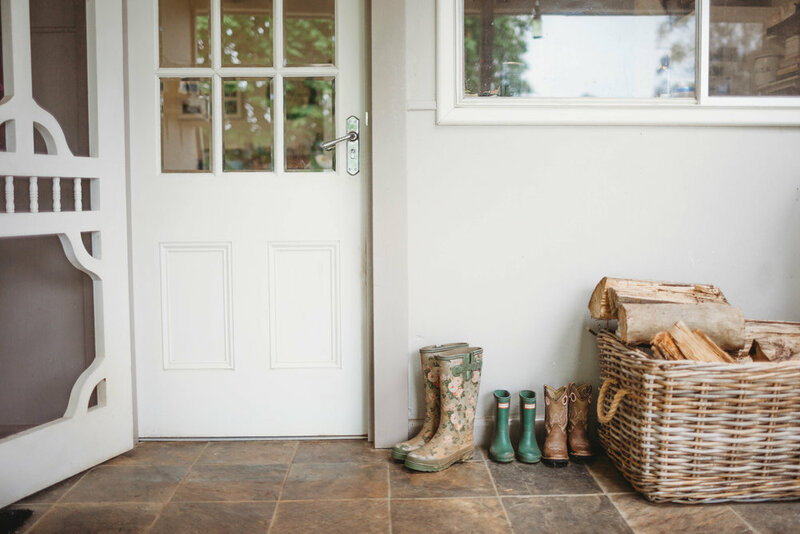 Social media and blogging has opened a huge array of doors for me through sharing our simple country life in our little farmhouse on a hill here in Thorpdale. The disconnect between city and country is being bridged by social media, whilst at the same time our world is seemingly getting smaller as we are more connected than ever. It is a strange paradox. Sharing our farming adventures and what exactly goes on with crutching our ewes or planting spuds come Spring or drafting lambs ready for sale, I see my role as a blogger and social media influencer as very much a part of being involved in farming. I have unwittingly become an agricultural advocate and voice for farming in Gippsland (apparently?!) without even intending to. But this is the path that I have created for myself in a modern farming scenario, which speaks volumes of the diverse way you can use skills in farming. You don’t need to be driving a tractor or milking a cow to make a difference or contribution – that has taken me some time to acknowledge. 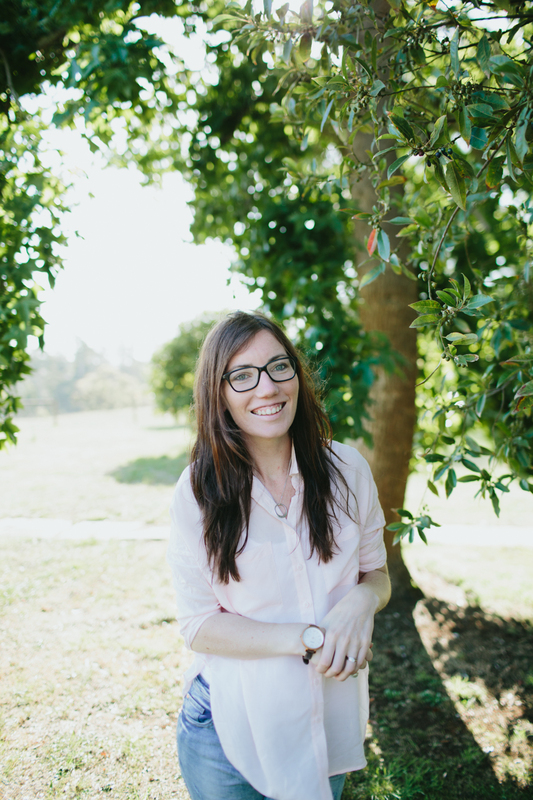 The agricultural industry has changed enormously in the past ten years to when I tentatively dipped my toe in…I could have never imagined that my blogging or humble Instagram account of what was happening on the farm could connect in the way it does now. Simple farming stuff is big important stuff. I truly believe that and is why I keep hitting publish, sharing and starting conversations about farming with my online community. Although I am busy with two young children these days, I like to keep a hand in the running of my family’s farming, produce trading and interstate trucking operation. My brother and his family also live on farm and together with my dad we run a multi-generational family farming business. There is a huge amount of pride involved in that. Although I now don’t share the surname on the front gate, there is definitely a sense that myself, or my sister-in-law, feeding the shearers and paying the wages and doing a truck drivers paperwork makes a difference…even if it is just to us, but I like to think it matters to our long time suppliers and customers also. Sometimes when I’m in the office I might answer the phone to be greeted by a grower who remembers when I was running around the truck yard as a toddler my girls’ age, or I’ll pass a cup of tea to a shearer in the sheds who has been throwing fleeces over that wool table since my grandfather was getting $50 for a lamb in the Thorpy saleyards. Things like that are what matters to me as a farmer, being involved in a family farming business, and I really try to instill this love of the land and of what we do here to my girls. It’s a way of life, and they probably don’t think much of it, which is half the point: it’s just an ingrained unspoken way we live. But it’s vital to both myself and Matt for them to see simple things like working together as a family unit to sow, grow, reap and harvest something of worth. To know the value of hard work, to understand boom years and drought years, of seasonality and the vulnerability that comes with farming. The good, the bad, the tough calls and the simple joys, and particularly being a woman farming – paddling hard below the surface or forging their own unique path to new opportunities. Or making delicious jam to go on the shearers’ scones, one of the most important jobs on the farm in my opinion: fueling farmers to feed the world. Being a third generation potato farmer, one of the most commonly asked questions fired at me is "how do you get the perfectly roasted potato?" (along with "do you eat potatoes every night?! "*) Well, I'm glad that you asked...because with Christmas less than a week away (nobody panic, are you panicking?!) it's time to brush up on getting those roast 'taters juuuuuust right. You want gorgeous crunch and lovely crisp edges, those scrumptious corners that truly make a good roast potato, with a fluffy pillow of potato goodness on the inside. Potatoes – I am surprisingly not sold on any particular variety for roasting, it really depends on what you like! My advice would be to experiment, you’ll soon discover your roast potato groove (and the array of potato varieties available whilst you experiment!) For this recipe I used Colibans, which are a more floury potato (not waxy). I like this to get that cloud of fluffy potato inside the cooked spud. But at this time of year any new season potato is going to really rock the socks off being roasted in this way. Sebago’s will be similar to the Coliban. Dutch Creams are also good. If you want to support Thorpdale potato farmers, buy brushed (the dirty spuds!) potatoes in Coles, Woolworths, Aldi, green grocers from January to June. Chances are a Thorpdale potato farmer grew them. Oil – I generally use a good extra virgin olive oil to cook my roast potatoes in. The alternatives would be butter or any sort of fat (duck or goose). Extra virgin olive oil gives a lighter flavour, but a butter or fat is pretty decadent and scrumptious for a special occasion like Christmas. 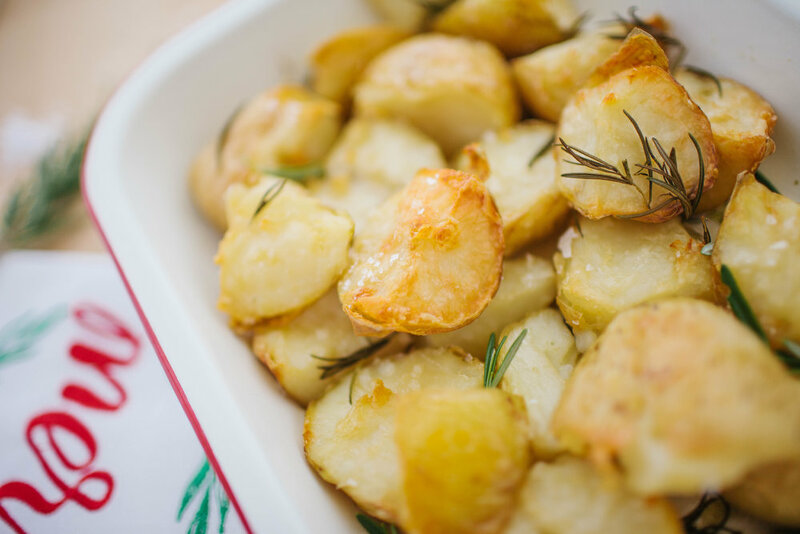 Salt – a good quality sea salt gets liberally thrown about over my roast potatoes. My mum once told me to treat roast potatoes almost like you would pork crackling – when you think there’s enough salt, add a bit more. Herbs – rosemary is always my go-to with my roast spuds. But it often depends what I’m serving them with, if it’s roast lamb I generally use mint, or a lighter meal sometimes sage. Rosemary is classic, and readily available from my huge bush at the back door! Firstly, preheat your oven to 190-200 degrees Celsius. 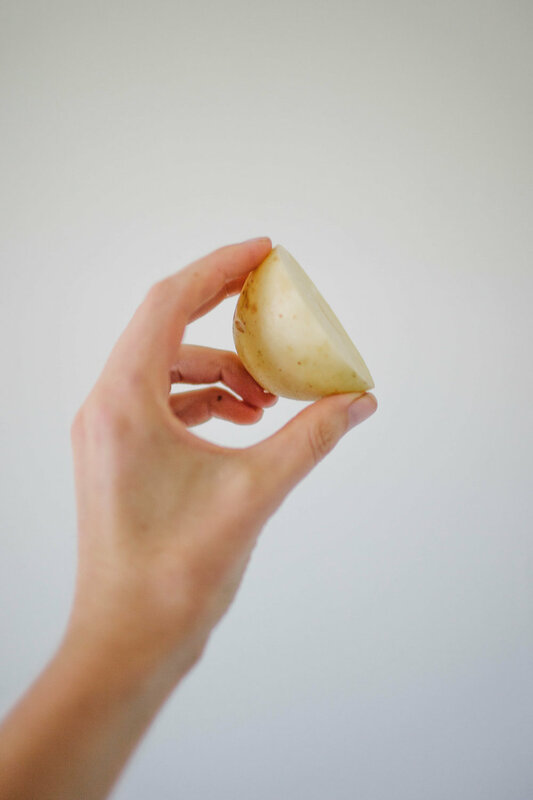 Cut your potatoes into halves or quarters, or keep whole, depending on the size of your potatoes to begin with. The key is to keep them all fairly uniform in size so that they will cook evenly. Here is an example of the size I tend to aim for (and yes I have a freckle on the inside of my pinky finger)! Peeling them is a personal preference. For roast potatoes I don’t generally peel them, a lot of the goodness is in the skin. But with new season potatoes, freshly dug, these ones had pretty delicate skins anyway so I kept them on. A light scrub to get the dirt off and I broke some of the skin anyway. This could actually be beneficial in creating more edges for crispy goodness! Pop your potatoes into boiling salted water for 10-15 minutes. This par boiling is essential to getting great roast potatoes. This ‘pre-cooking’ of sorts releases the starch out of the potatoes, so when it comes time for the oven they can just concentrate on getting deliciously golden and crispy on the outside. Drain them in a colander – and now this is also a key element to getting them juuuuust right: give the colander a little shake around so that the edges of the potatoes rough up. This will create some texture and little edges to your spuds, those parts are key to getting crisp and perfectly roasted potatoes. Put the potatoes onto a roasting tray, ensuring they are all one level, don’t pile them on top of one another. Bake in the 190-200 degree oven for 30 minutes. Pull them out and give them a little squash, just another little rough up, with the back of a spoon or a potato masher if you’re that way inclined (my mum always mashed her spuds with a fork, never a masher!) Throw some more oil or salt on the spuds if you think they need it, also some rosemary or garlic cloves. I like to add my herbs halfway through the cooking so as not to totally incinerate them! You will still get the flavour of the rosemary coming through. And…that’s it. You should have perfectly roasted potatoes. Crispy edges with those yummy crunchy bits. Cloud of softness on the inside. It really is that easy. Not rocket science. Completely humble and simple…just like our beloved spuds. They are so versatile, yet the simplicity of a well roasted potato can rarely be beaten. Especially on Christmas Day, where there can be a lot of anxiety and fanfare around food, when really…it doesn’t have to be a grand affair or complicated or extravagant. It needs to be made with love and shared around a table of family celebrating just being together. Happy Christmas, from our potato farming family to yours. May it be humble and simple, merry and bright.